Nintendo is considering a deal with Sharp to make free-form displays for an upcoming gaming or quality of life product reports The Japan Times. The sources indicated that Nintendo is considering a display design with a hole in the middle, said to be "doughnut shaped." In June this year HEXUS reported on Sharp's free-form display, touted as a way to bring "device design freedom" to electronics industrial designers. The prototype we saw looked like a set of three circular car dials, an undulating form made from a single display panel. 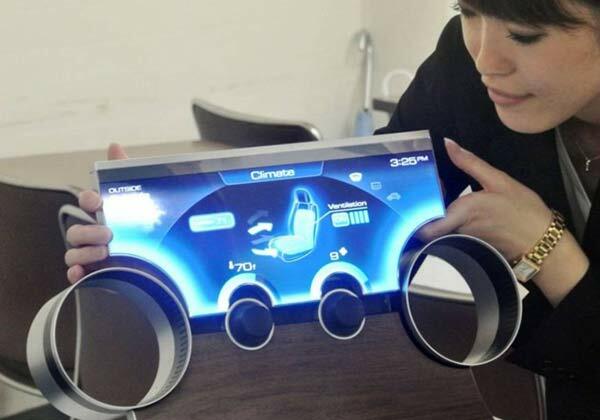 Sharp is bringing forward its manufacturing plans to start production of its free form displays a year earlier than it previously expected to do, says the Japan Times. Mass production is set for early 2016 it says. These innovative new displays will be important to the company as it, like Nintendo, has been struggling with turnaround efforts. How will Nintendo make use of Sharp's free form display possibilities? The doughnut idea is hard to imagine fitting in with current game designs or media consumption, but Nintendo has come forward with compelling left of field gaming devices before like the original Wii. Looking at the portable market, Nintendo President Satoru Iwata has implied that the 3DS successor will have to be dramatically different "It won't be enough that we simply upgrade," he said. A doughnut screened console sounds like it fits the bill. I think it's most likely their Quality of Life product rather than a gaming device. If it's something that sits on your bedside table monitoring sleep patterns and whatnot, then I'm sure they're looking at an interesting design rather than some boxy clock looking thing. As for that report of Wii injuries, several of them are due to exercising, and that's not a Wii issue, and actually a great thing that the Wii introduced, the idea that you could use a console for something that doesn't involve just sitting and twiddling your thumbs. I guess this is one of those other games machines that AMD will be supplying chips for. I'm failing to see how a toroidal screen will be useful in any context (and especially any general-purpose context). The closest I got was if it's flat on a table, with multiple people sitting around it, each with their own area of screen to view. But that would have to be a pretty big donut. Maybe it's even bigger than that, and you sit inside it. It would be used for single player star trek simulators, for gamers who have no friends.